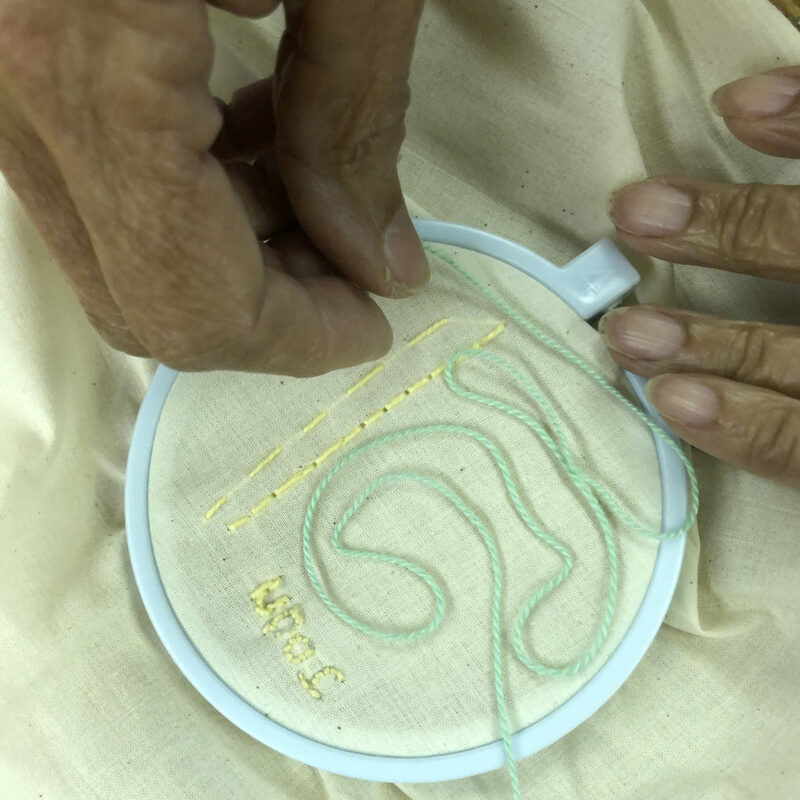 Through my (Im)migration Lines Artist Residency at Wyckoff House Museum, sponsored in part by a Brooklyn Arts Council Community Arts Fund grant, I led embroidery and textile arts workshops for local seniors at Midwood Active Adults from January – June 2018. Workshops took place monthly, and included a visit and tour of Wyckoff House. I provided supplies and instruction; participants revived childhood and early adult skills in embroidery and needle arts, threading narratives through stitched drawings. 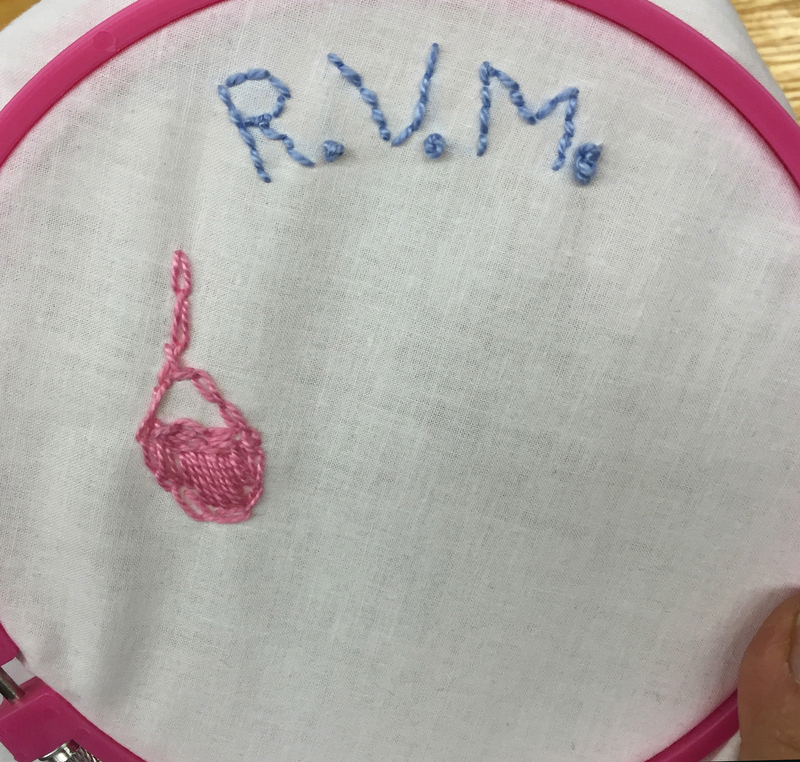 We began with stitch samplers, after which, participants took initiative to create personally expressive artworks. Several finished pieces were included in the BAC-sponsored Nou la – We Reach! exhibit at Wyckoff House from June – October 2018. 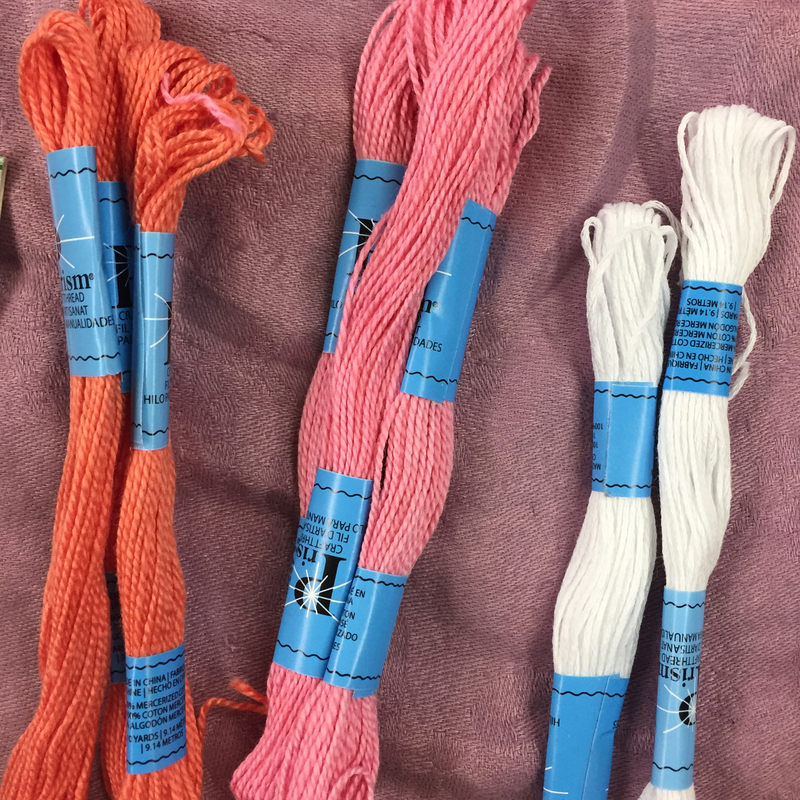 Supplies for first embroidery workshop, 1/17/18. 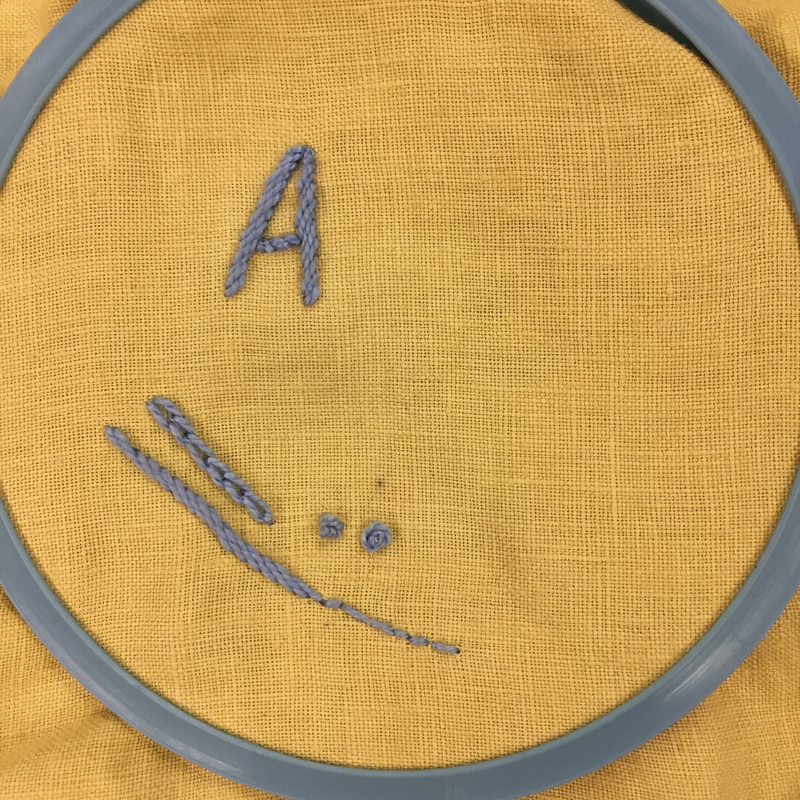 Ardley beginning a stitch sampler, Class 1, 1/17/18. 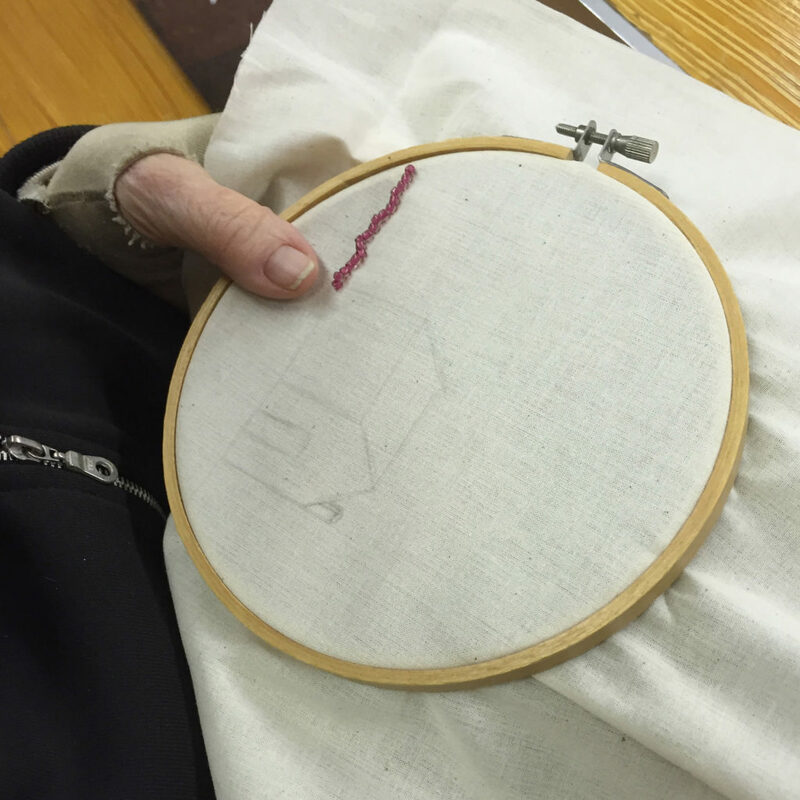 Ardley holding embroidery hoop in progress. Week 4, 4/11/18. 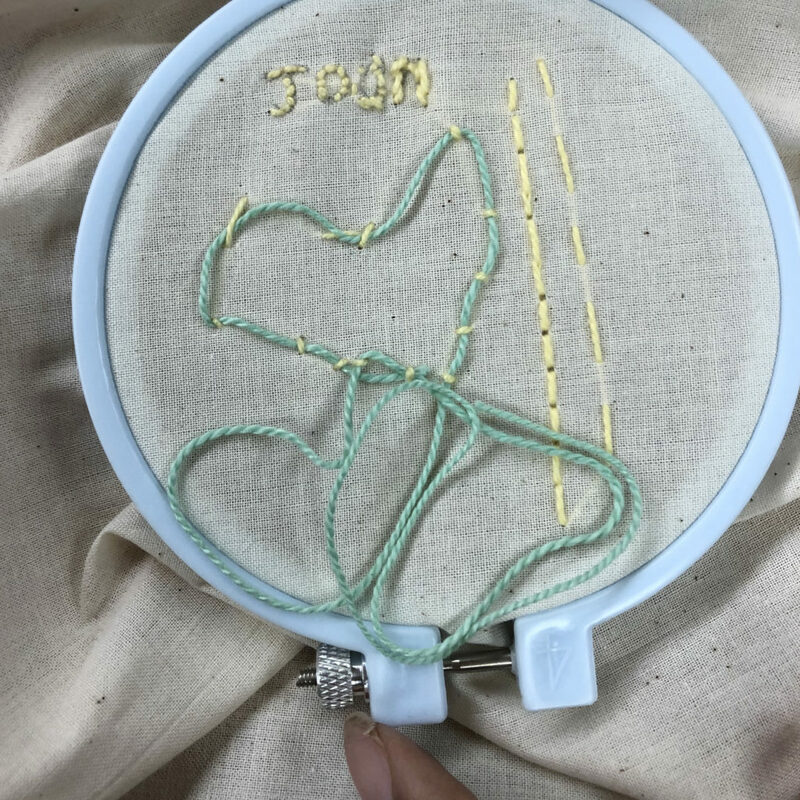 Joan learning couching stitch and starting a stitch sampler, 4/11/18. 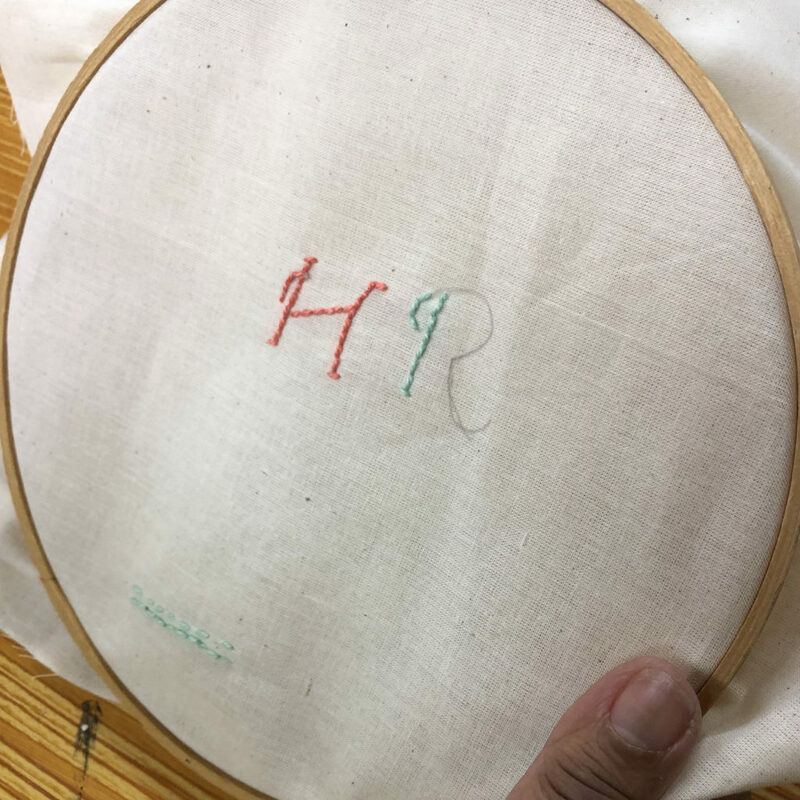 Hazel using backstitch for her initials, 4/11/18. 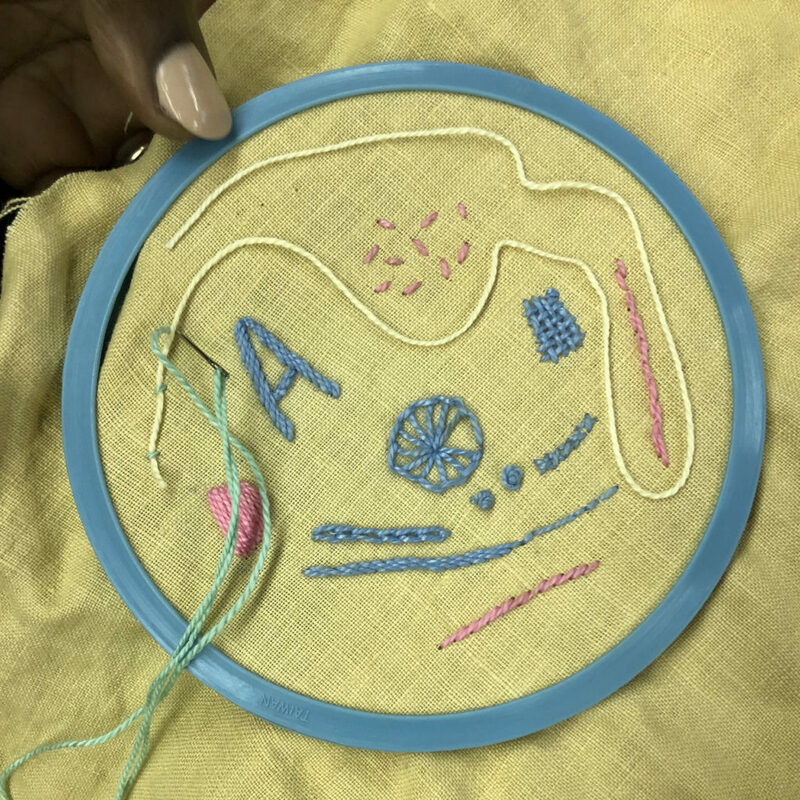 Pamela, an experienced embroiderer, participated in some of the workshops. 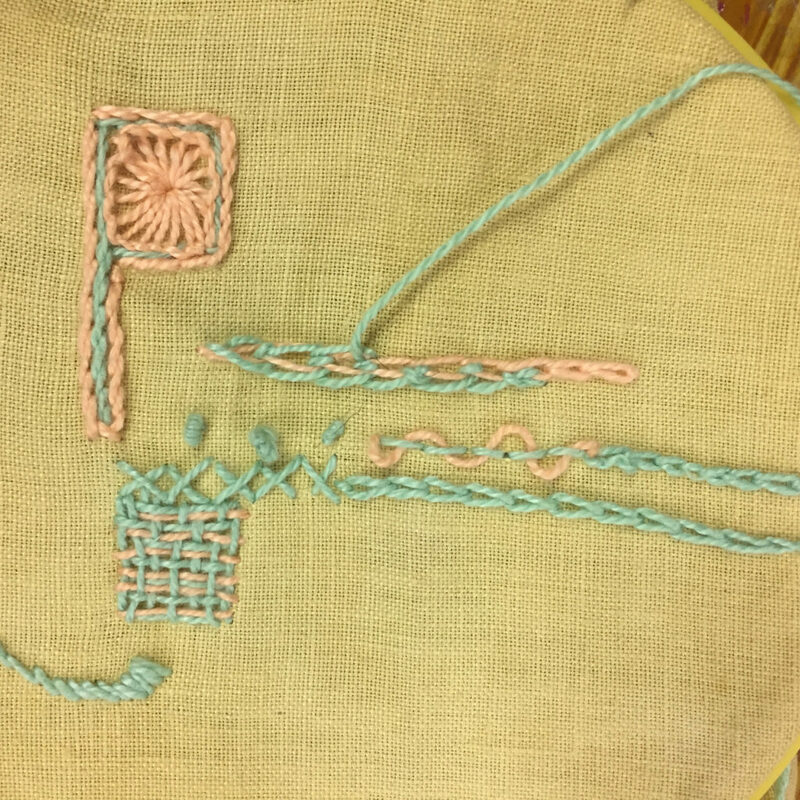 Self-directed, she often asked for more complex stitches, like the pinwheel inside the “P” and the woven stitch at bottom left. 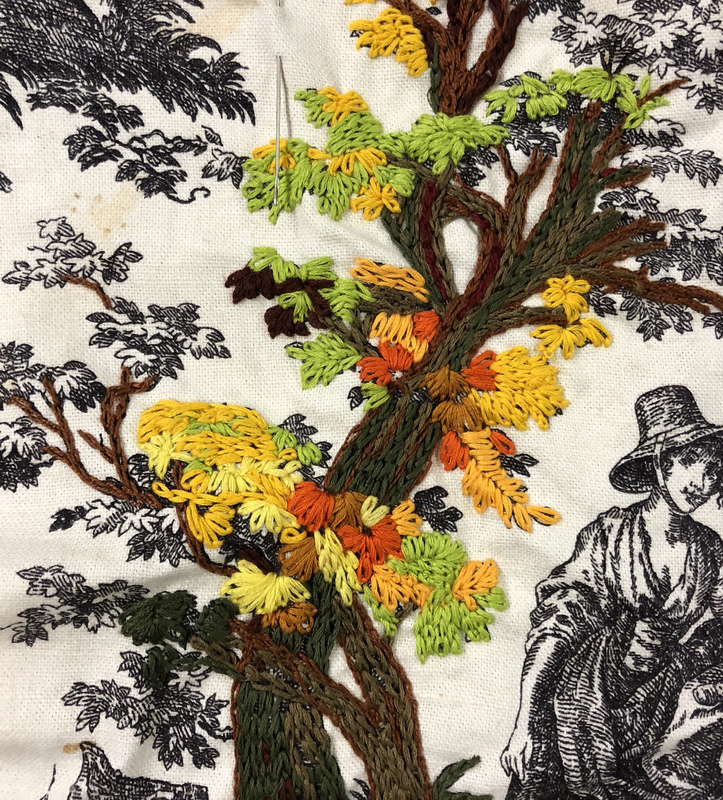 Pamela’s self-directed artwork, “painting with thread” over an existing toile fabric pattern. Winter–Spring 2018. Robin beginning a stitch sampler in our first workshop, 1/17/18 at Midwood Active Adults. Robin’s Self-Portrait in Progress. May 2018 workshop at Midwood Active Adults. 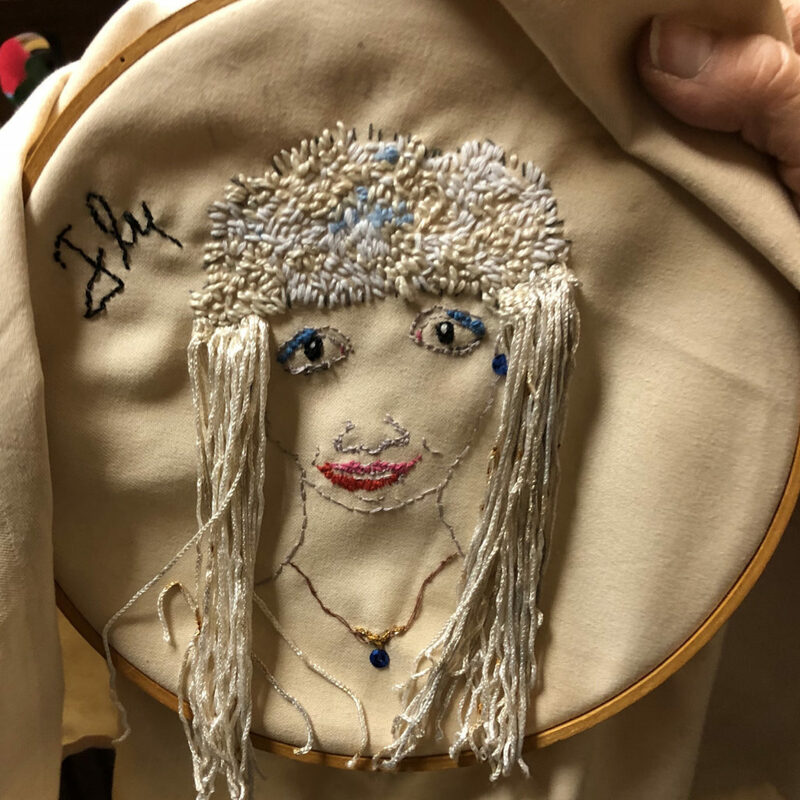 Linda, an experienced textile designer and artist, beginning embroidered and beaded artwork, 2/7/18. 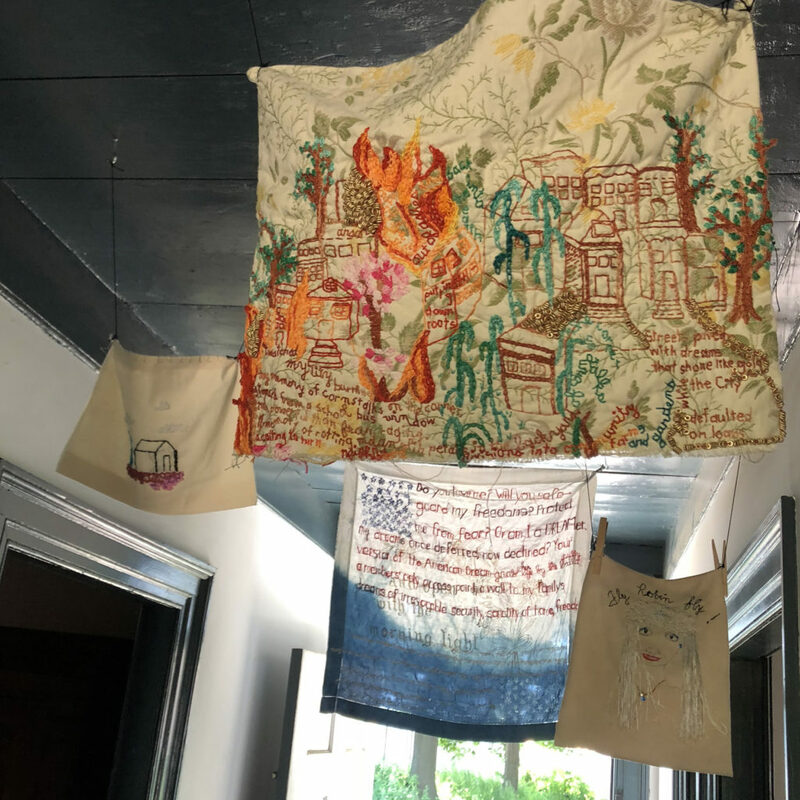 Works by participants in Midwood Active Adults embroidery and textile arts workshops installed alongside my works in BAC-sponsored Nou la – We Reach! exhibit, 6/16/18. Seniors’ works include the beaded, embroidered house by Linda Schneider (leftmost work) and “Fly Robin Fly!” by Robin Marion, bottom right.